In order to really understand it is so important for us to have empathy for those living with allergies. Think for a moment about the big events that most people celebrate – Christmas, birthdays, weddings, family gatherings etc. What is one of the main focuses of all of these? FOOD! How would you feel if you had to bring your own food to all of these celebrations for fear that your life might be in danger if you ate something? This is an unfortunate reality for those living with severe allergy. It is not only a logistical nightmare but can be extremely isolating. I have heard many complaints from parents about not being able to pack nuts in school lunches, but what if it was your child who could die because of accidental exposure to a food allergen? So what exactly is an allergic reaction? When the immune system reacts to substances in the environment that are harmless for most people an allergic reaction occurs. This involves mast cells, which are found in the skin, gut, lungs, nose and eyes. 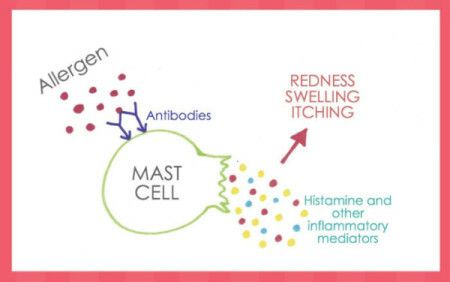 Mast cells are designed to protect our bodies from potential invaders and are filled with irritant chemicals including histamine. When an allergen enters the body, an antibody response is triggered. These antibodies attach themselves to the mast cells, causing them to ‘degranulate’ or spill their contents into the tissues, resulting in the redness, swelling and irritation of an allergic reaction. This diagram demonstrates why I am a Naturopath and not an artist… It looks more like a spilled bag of marbles than a mast cell but hopefully you get the idea! The low down on allergies in Australia. Allergies are very common and increasing in Australia, with approximately one in three people being affected at some time in their lives. Food allergy alone affects around 8% of children, 10% of infants, and 2% of adults with numbers continuing to increase. 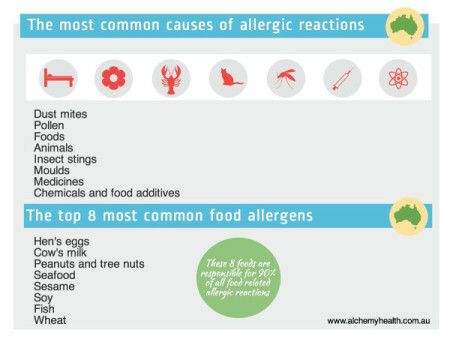 Most of the statistics around allergy focus on food but it is important to remember that environmental and chemical allergens can also cause severe reactions. Food allergy prevalence in Australia is no longer rare, with 1 in 10 infants suffering from some form of food allergy. 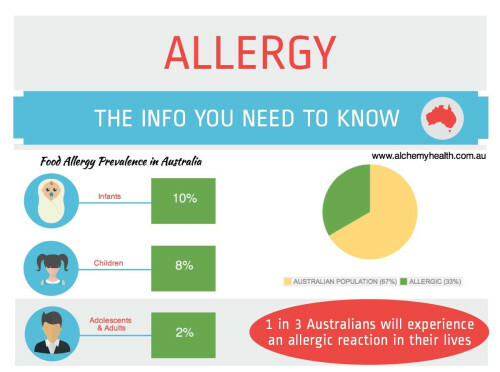 Australia is not alone in the rapidly increasing occurrence of allergic reactions. In the last ten years hospital admissions for allergic reactions in Australia, the USA and UK have doubled, and in Australia, admissions due to food allergy, in children aged 4 years and under, has increased 500%. This is an alarming rate in such a short period of time! Does allergy run in families? Yes it does. Atopy or atopic disease is a term used to describe a family likelihood of developing allergies when other family members suffer from allergy or asthma. Eczema is also a common characteristic of atopic disease. This tendency to develop allergic diseases is a genetic predisposition and when atopic people are exposed to certain foods, chemicals or environmental triggers they can develop an immune response that leads to an allergic reaction. 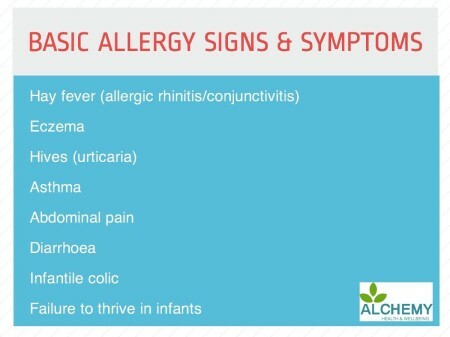 Signs and symptoms of allergy. So what signs and symptoms do you need to look for to determine if you or someone else is having an allergic reaction? The basic allergy signs and symptoms to be aware of. Here is where the empathy and action come together to save lives. Reduce exposure risk for those with known anaphylaxis by being aware of potential triggers. Know the warning signs and be familiar with an action plan. Knowing the signs of anaphylaxis could save the life of you or someone you love. 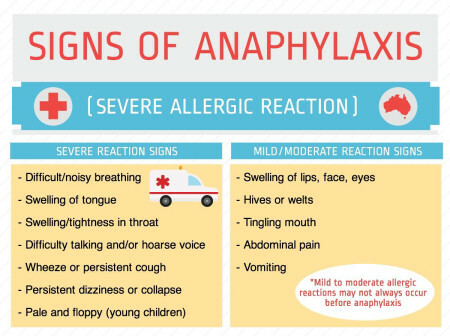 Please read the ‘Action Plan for Anaphylaxis’ chart so you are familiar with how to respond if you see any of the above signs of anaphylaxis. Allergy is an issue that is very close to my heart and although we fortunately do not have any anaphylaxis in our family I have many very close friends and clients who are at extremely high risk of anaphylaxis, even due to airborne exposure to allergens. This is an issue that is becoming so much more prevalent and if it hasn’t already touched your life, it most certainly will some day soon. It is time for us to grow our awareness and empathy as a community in order to reduce the isolation and risk for those living with the fear and physical implications of allergies and anaphylaxis.